Chromecast owner? Read this - Free Chromecast offers! I’ve been a Chromecast user for a while now, and it’s a nifty piece of kit that still gets lots of use in my house 10 months after purchase. I’ve only recently learnt about the free Chromecast offers that are available, so I thought I’d share. I originally bought my first Chromecast earlier this year (and you can read the review here.) It’s proven so popular with the kids that I’ve bought a second one so that they can play their favourite YouTube videos in the bedroom too. However, despite being a regular Chromecast user, it never occurred to me recently to have a look at the menus it offered. Hidden under one of the menus is an option which reads “Chromecast offers”. If you click on that, it brings up a list of offers that are available to you. This works in the UK as well as the USA. The first thing to do is to head over to the Chromecast Offers page. Step 1. Tick the box and click Continue. 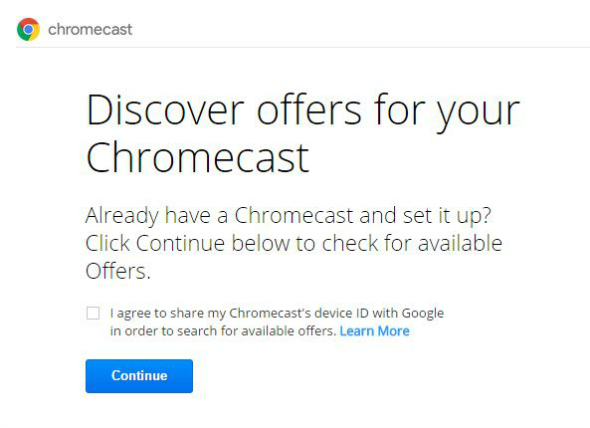 Step 2 - Click on “Select your device” and choose your Chromecast. 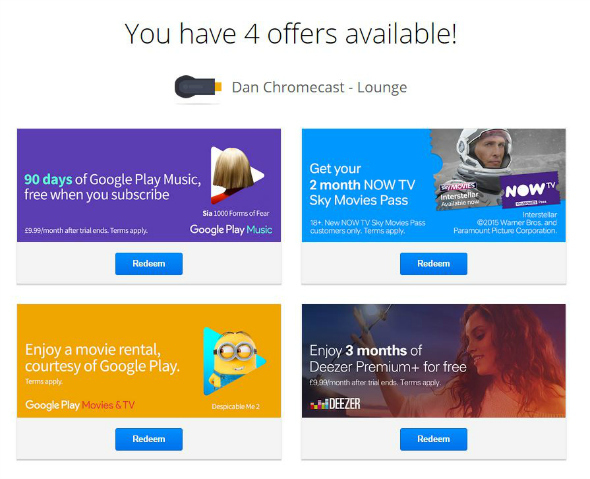 It’s worth noting that you can redeem offers on individual Chromecasts, so if you have two Chromecasts, you can get two lots of offers. 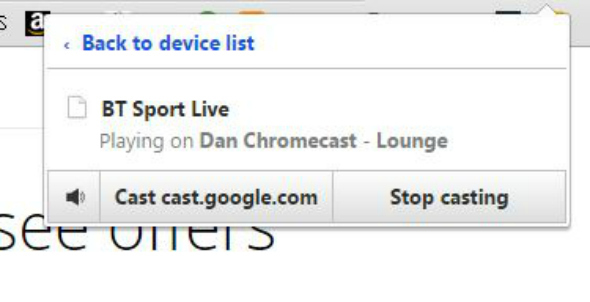 Step 3 - In the pop-up box, click the Chromecast that you want to use. In my example, I’m already casting BT Sport. Step 4 - Choose the “Cast cast.google.com” by clicking on it. Step 5 - Your tv should automatically switch to your Chromecast and will display what offers are available for you. 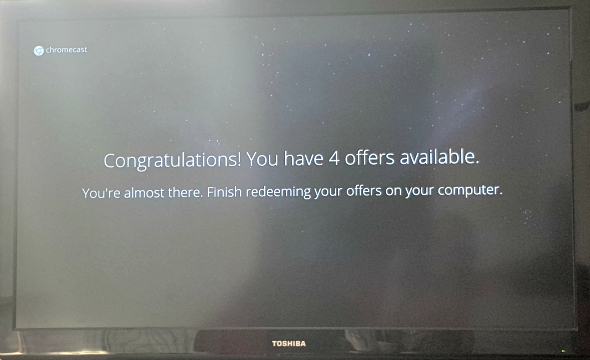 Step 6 - Head back to your computer and your offers will show on screen. Simply click “redeem” on the offer that you want to get. Step 7 - A new window pops up asking you to click continue to get your offer - in this case, a free movie rental. Step 8 - Pick your film. This screenshot shows only a fraction on the films on offer. On the Chromecast that I bought back in March, I was able to redeem £15 worth of Google Play credit (so effectively half of what I paid for the Chromecast at the time), and on my newer one I was able to get an HD copy of the original X-Men film. 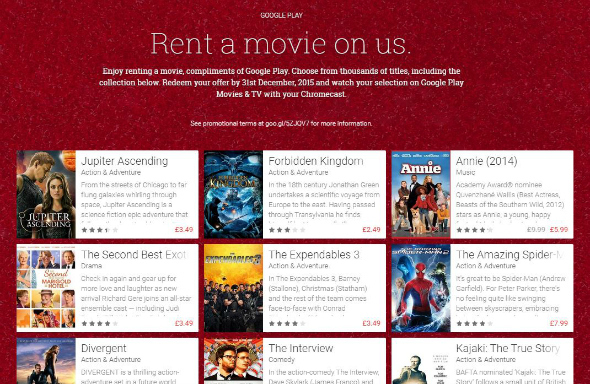 At the time of writing, the current UK offers are A free X-Men film from Google Play, plus £15 worth of other movies, 3 months Now TV free, and 3 months Google Music free. The collective cost of these items is more than you’ll pay for your Chromecast! You can get your Chromecast via Amazon or HaveYouSeen by clicking on the relevant links.